We were not quite sure of what to expect with the Swigart Museum. 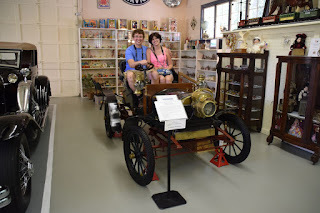 The car collection is widely known to be highly acclaimed, but what we were really blown away with was the knowledge and kindness of our tour guide, Marge. She has spent a lifetime at the museum, caring for the cars, collecting goods, explaining them, and more. She made this tour special. She added context to what are already amazing cars. Spending a lifetime with these cars, she knows the background of each and every one of them. The Swigart Museum is the result of a Huntingdon businessman, Willam E. Swigart, seeing a rapidly evolving automobile industry in the 1920s, and realizing that with the changes in the industry, many automobile companies were already going under, or merged, in addition to the existing ones changing at a rapid pace. He began collecting all things automotive, such as cars, car emblems from junkyards, license plates, and more. The end result of this collection is one of the finest snapshots in time of the golden age of automobiles. It is believed that this museum has the largest collection of emblems and license plates in the world. The car collection is also one of the oldest and finest in the world. He also collected other things, such as toys, shaving cups that were used in barber shops, and even spittoons, like you see in those old western movies. Swigart had a home in Huntingdon that he split between selling insurance, and displaying his collection of random artifacts. In 1957, Swigart opened up the current museum, now a fantastic draw for travelers of the historic Route 22 William Penn Highway and visitors to the Raystown Lake region. The museum is located in the midst of some spectacular scenery on Route 22. There are walls and and walls full of old car emblems. Here are two of my favorites, Pontiac and Dodge. Shaving cups from days gone by at barber shops. Between these and the spittoons, these are from an era that I am not familiar with. Hearing the background story of these from Marge was fascinating. The museum has a collection of hundreds of spittoons, one of which is displayed under each car to look as if they are collecting oil from leaky engines. This is not the case, but it is a clever way to display all of them. The toy collection at Swigart's is exquisite as well. The horn collection. It is clear to see the evolution of the automobile as you venture through the halls of this great museum. Here are some "riding goggles," those things you often see drivers wearing in old movies. You can almost picture someone wearing these with a leather jacket, with a woman in the passenger seat wearing a scarf that is flying in the wind. These artifacts conjure up that image for me and make me wish I was born in a different era. The way we drive around and explore has to be similar to that of the golden age of automobiles, minus the goggles. Early spark plugs. You did not have to take apart half of the car to replace them, granted you likely had to replace them much more often. The state has a heritage with spark plug production, with Champion Spark Plugs having produced many of them in Pennsylvania. A former hub plant of theirs was located in Hellertown, PA. The site is currently a superfund site, but I digress. The early license plates had expiration dates printed right on them. I would not mind seeing them go back to that system, considering how the newer plates fall apart within a few years. An antique stamp press. Aside from the fantastic cars, the collection of random things is absolutely fantastic. It is clear that the museum has been a labor of love for the team. And genuine markers from a Pennsylvania Railroad locomotive? Some of the awards that the museum has received for their cars at the Elegance at Hershey car competition. On the wish to live during the golden age of the automobile, I would also love to have lived during the golden age of railroading. They have countless automobile emblems and lug nut covers. Every corner of this museum's collection was accompanied with my jaw dropped in amazement, and I sincerely mean that. This place is not just incredible, it is world class. Look familiar? The old RCA Victor logo in real life! A Bantam logo. Butler, PA was home to the Bantam Jeep company, and home to the first design of the Jeep. It was designed and sold to the British at the start of World War II. When America was plunged into the war, the Jeeps were a part of the American armies as well. The Jeeps were credited with giving an edge to the allies during the war. Unfortunately, Bantam would eventually go under since the plans for the Jeep were government property. An ode to the oil heritage of Pennsylvania, with several of the oil companies that owe their existence to Pennsylvania, Pennzoil and Quaker State. Another piece of the priceless memorabilia the museum displays. Some of the jaw-dropping collection at the museum. These are some antique toys! Once again, I am thinking that I grew up in the wrong era! Now back to the Oldsmobile. This is a 1903 Oldsmobile Curved Dash roundabout. A roundabout was a scale replica of the full-sized unit. Salesmen would use the replicas as demos for the consumer to check out. You have to remember that in they were pioneering this field in these days. There was no way to buy a car "off the lot." Salesmen would set up camp in places, and even go door-to-door, with these models. This is the full-sized version of that Oldsmobile. This was said to be the favorite automobile of William Swigart Jr, the founder of the museum. This car was sold by the pound, similar to the way you buy deli meat. There was a price-per-pound with these cars. 1905 Rambler Surrey Type 1. Such an elegant car. 1910 Buick. Notice the old crank on the front. A 1913 Ford Model T Pickup Truck. My father talked about how my Great Grandfather and Grandfather drove one with their carpentry business in the Nanticoke area, just outside of Wilkes Barre. This one was used as a farm vehicle. It is rare to see these in such pristine condition, considering that most of these were run into the ground. You can still see some of the skeletons of these rotting away at old farms. Notice the spittoon underneath the car. To create space to display all of the spittoons, they placed them throughout the museum to look like they are oil drain pans. Nifty way to display them. Side view of the truck. A 1911 Sears. You could purchase anything through the Sears Catalog in those days, including their own automobiles. It seems that Amazon has some work to do if they plan on being the ultimate mail-order conglomerate of all time. The museum has an archive for their thousands of license plates. The collection of plates began during World War II, because the plates were being taken to support the war effort. One of the only ways that the plates survived was if they were in the collection of a museum, so folks from far and wide sent their plates to Swigart, and then after the war people went and reclaimed their plates. Many went unclaimed, and became part of the collection. They have plates from all fifty states, and from different places around the world. A 1932 Plymouth. Something stuck out about this car to me. All of the cars were gorgeous, but I felt a connection to this one. I was probably influenced by the fact that my first car was a dark green Plymouth, granted it was a 1995 Plymouth Grand Voyager minivan, but I loved that car. Something about this elegant car stuck out to me. A 1931 Ford Model A. The cars seemingly started to get more and more spectacular. A 1920 Carroll. This is the only remaining car of its kind. Built in Lorain, OH, this was the personal car for the man who founded the company. Sadly, Carroll went under when many car orders were sent in a train shipment that got destroyed in a train shipment that got caught in a blizzard. The missing or inadequate coolant had frozen and busted the engines, leading the inventory that was bound to dealers to get scrapped. This and an economic downturn sunk the company. This 1908 Studebaker Electric car was built to carry senators from the old senate building to the capitol in an underground tunnel. It is not equipped with turning wheels since this vehicle literally went straight from point A to point B. It did not carry enough people, so they quickly abandoned these elegant vehicles. 1919 Pierce Arrow. Did I mention how ridiculously elegant the cars are at this museum? A 1922 Ford Model TT dairy delivery truck that is seasonally on loan to the museum. It was in someone's barn for many years, and they offered it to the museum as a display. The logo of the museum. The museum also collects classic bicycles! A 1937 Cord. A masterpiece of an automobile. I wasn't lying when I said that the collection gets continually more impressive! Cord was a part of the famed Auburn-Cord-Duesenberg umbrella. And that leads us to the next beauty, a 1936 Duesenberg Gentleman's Speedster, the only 12 cylinder prototype made. Swigart won this vehicle in an auction attended by car connoisseurs from all over the world, including representatives for Jay Leno. Swigart beat out Leno in this car, and Leno even mentioned losing out on this car in his show. This was one of the last cars that the company made before it went under as a result of the Great Depression. We jump back in time a little bit to check out this 1908 International Auto Buggy. It is pretty striking looking at the front grill of this and noticing how the general look of this is still reflected a little bit in International trucks today. Sitting in this 1904 Spencer is encouraged! 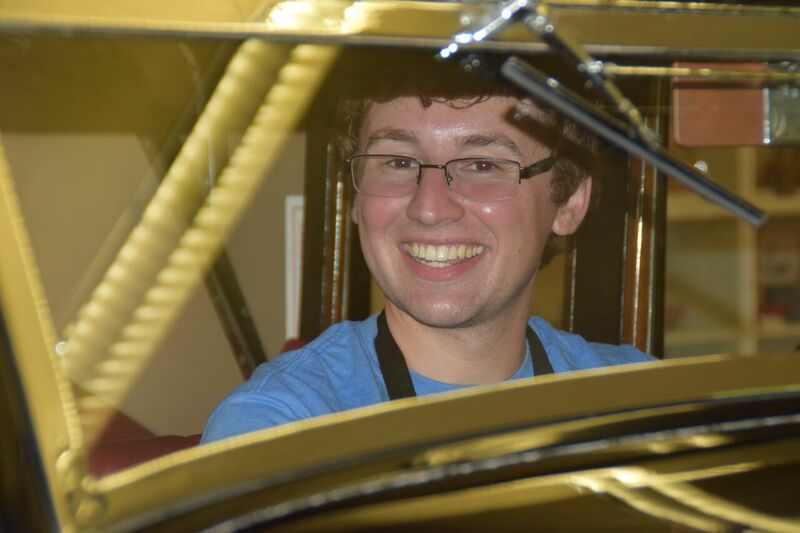 I was offered a once-in-a-lifetime chance to sit in the 1933 Duesenberg. Needless to say, I was blown away! This picture really shows the joys that I had at this museum. Here we see the 1952 Verrill Wolf Wagon. This two-door roadster is the only one that was built of its kind. An entrepreneur came up with the idea for this vehicle and pitched it to the major car companies. He got turned down, but the most incredible thing, aside from the fact that it is so uniquely beautiful, is that it was essentially handmade. Since many of the parts that he needed were not in a full scale production setting yet, he MacGyvered different parts for the car, including refrigerator hinges used on the doors. This elegant car never saw the light of day for production, but it is still a pretty awesome vehicle. 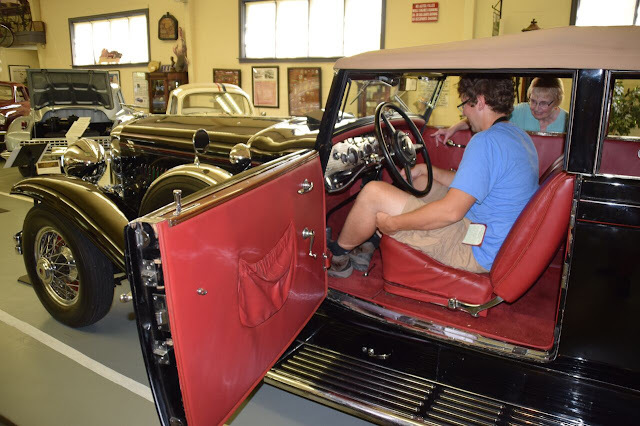 Recently, the museum sent the car out for work to Williamsport's Pennsylvania College of Technology. While it was up there, Jay Leno visited and drove the Wolf Wagon. He gave it a thumbs up! Brit's was the authentic Love Bug! This iconic automobile in cinematic history is authenticated to be one of the fleet of Lovebugs used in the films, complete with a California title card registered to none other than Walt Disney Studios. Brit was amazed to see the car. The Swigart collection's most notable and prized possessions are a duo of Tucker Automobiles. In the postwar 1940s, Tucker aimed to create a vehicle that was based upon safety, a car for the future. He saw the safety issues that cars had up to that point, and he looked to innovate. It seemed that he bit off more than he could chew, for the unveiling of the car had a series of problems, and the big three automakers in Detroit went and tried to derail him as much as they could. The big three had Tucker investigated by crony politicians, and only fifty or so of these vehicles were made. In postwar America, people were dying to get some new automobiles. These were some of the first rolled out, with high fanfare. Due to all of the red tape, the availability never came about for the Tuckers, but the mystique of them lives on to this day. The two Tuckers at the museum are dazzling. The prototype is an extremely historical car. It was the fifth car in the nation to be awarded with "National Historic Vehicle Register Status." It is amazing how one place can hold so many stories and so much excitement. The only thing at the museum that is even better than the collection, is the kindness and hospitality of Marge, one of the curators at the museum. We had a great time checking out this awesome place and we highly recommend visiting it for yourselves. We were hosted by the Swigart Museum and the Huntingdon County Visitor Bureau. We have shared our opinions about this great place.